Indexed in: Book Citation Index, Science (BKCI-S), Web of Science, BIOSIS Previews, EMBASE, Chemical Abstracts, EBSCO., Ulrich's Periodicals Directory. The Oxidative Stress Menace to Coronary Vasculature: Any Place for Antioxidants? 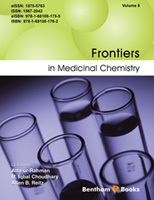 Volume 8 of Frontiers in Medicinal Chemistry comprises 6 chapters on topics of high importance in the fields of medicinal chemistry and early-stage drug discovery research. The topics and authors were selected from highly cited publications in the Bentham journals Curr. Med. Chem., Curr. Pharm. Des., and Curr. Top. Med. Chem. The original authors were given the opportunity to rewrite their contributions, particularly updating them with more modern insights and references that have emerged in the intervening period of time. The first chapter by Dr. Gary Caldwell is a tour de force review on the use of ADME optimization and toxicity assessment in drug discovery research. Dr. Caldwell has written multiple chapters on this ever evolving topic and has served as a book editor for Bentham in the past. His chapter in this volume of Frontiers is a valued and updated reference guide in the field. Chapters 2 and 3 by Briasoulis et al. and Escribano-Lopez et al., respectively, cover oxidative stress-mediated approaches to treat cardiovascular diseases such as atherosclerosis. The fourth chapter by Potenza et al. is on diabetes, and in particular endothelial dysfunction and the associated implications as to mechanism and therapeutic targets. In Chapter 5, Jokanović and Petrović review pyridinium oximes as cholinesterase reactivators for the treatment of organophosphorus poisoning. Finally, Rodik and colleagues discuss the current and potential uses of the cyclic macrocyclic oligomer calixarenes in biomedical research. I would like to express my gratitude to all the authors for their excellent contributions. I would also like to thank the entire team of Bentham Science Publishers, particularly Mr. Omer Shafi (Assistant Manager Publications), Mr. Shehzad Naqvi (Senior Manager Publications) and team leader Mr. Mahmood Alam (Director Publications) for their excellent efforts. We are confident that this volume will receive wide appreciation from students and researchers.